Nestled at the foot of a lush hillside, fringed by the pristine white sands of Muri Beach and overlooking a sparkling South Pacific lagoon, the Pacific Resort Rarotonga is a paradise setting for a Cook Islands holiday. A spectacular setting from which to enjoy a relaxed, beachside vacation, Pacific Resort Rarotonga comprises of spacious, well-appointed accommodation in a blissfully tranquil environment. Facilities at Pacific Resort Rarotonga include a swimming pool and massage treatments, as well as excellent dining options. 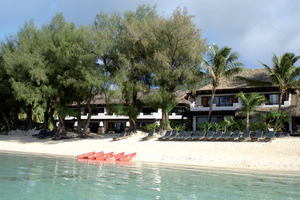 Overlooking a sparkling lagoon and tucked at the foot of a lush hillside, Pacific Resort Rarotonga offers refined accommodation that will appeal to romancing couples and families alike, with 64 luxurious and well-appointed suites and villas positioned within the tropical gardens and on the beachfront. As well as its privileged position on the edge of the lagoon, Pacific Resort Rarotonga will impress with its facilities, which include pampering massage treatments, a swimming pool and a variety of watersports options. Pacific Resort Rarotonga also features a variety of dining options, including theme nights and chances to feast on delicious seafood aboard the Lagoon Cruiser. The Standard Studio rooms at Pacific Resort Rarotonga offers 36sqm of accommodation space, including basic kitchen facilities, such as a microwave, toaster and electric frying pan. 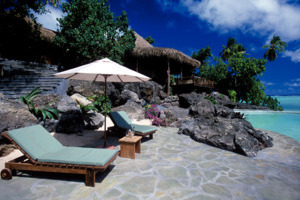 The rooms are located in the lush tropical gardens with a private balcony. The Standard Family rooms at Pacific Resort Rarotonga offers two spacious bedrooms, making it ideal for families and larger groups. 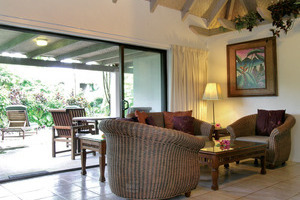 Located in the lush tropical gardens the Standard Family rooms come with basic kitchen amenities and a private balcony. The Premium Family rooms at Pacific Resort Rarotonga are located on the ground floor with a private furnished patio opening out onto the tropical gardens. The family configuration comprises of two single beds replacing the living space, or it can be specified with a separate living area. The Premium Garden Suite at Pacific Resort Rarotonga are positioned in the beautiful tropical gardens and come with a separate living area, plus a lavishly-appointed bathroom. All Suites are located on the ground floor for easy garden access. The Premium Garden Villa at Pacific Resort Rarotonga offers 120sqm of accommodation space and comprises of two bedrooms, two private en-suite bathrooms and a separate lounge. Guests can take advantage of the Villa’s private outdoor courtyard to have a BBQ and relax in the pleasant South Pacific climate. The Lagoon View Villa at Pacific Resort Rarotonga offers 180sqm of accommodation space, with superb views out across the lagoon and easy access to Muri Beach to be enjoyed. Split across two levels, the Villa comes with two bedrooms, a full kitchen and bar and a private outdoor courtyard. The Lagoon Villa at Pacific Resort Rarotonga offers 180sqm of accommodation space and is available with three bedrooms, making it ideal for larger groups and families. Spread over two levels, the Villa features a unique mezzanine lounge and overlooks the beautiful lagoon and white sand beach. The Premium Beachfront Suite at Pacific Resort Rarotonga offers 53sqm of accommodation space and enjoys a privileged location on the edge of the beachfront for stunning views and direct access. All Suites come with a kitchen amenities and a separate lounge area. The Beachfront Villa at Pacific Resort Rarotonga offers 180sqm of accommodation space and is located on the edge of Muri Beach for stunning ocean views and easy access to the soft sands. The Villa features two bedrooms, a full kitchen and bar, a lounge area and a private outdoor courtyard.